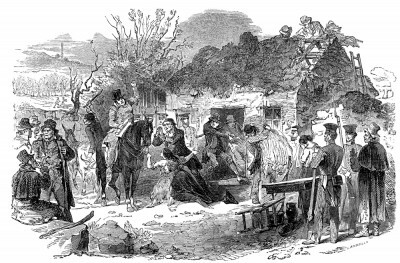 To support the famine relief effort, British tax policy required landlords to pay the local taxes of their poorest tenant farmers, leading many landlords to forcibly evict struggling farmers and destroy their cottages in order to save money. From Hunger on Trial Teaching Activity. 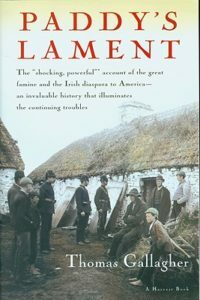 By contrast, Holt McDougal’s U.S. history textbook The Americans, devotes a flat two sentences to “The Great Potato Famine.” Prentice Hall’s America: Pathways to the Present fails to offer a single quote from the time. The text calls the famine a “horrible disaster,” as if it were a natural calamity like an earthquake. And in an awful single paragraph, Houghton Mifflin’s The Enduring Vision: A History of the American Peopleblames the “ravages of famine” simply on “a blight,” and the only contemporaneous quote comes, inappropriately, from a landlord, who describes the surviving tenants as “famished and ghastly skeletons.” Uniformly, social studies textbooks fail to allow the Irish to speak for themselves, to narrate their own horror. 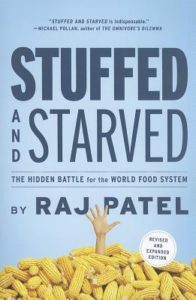 “Stuffed and Starved”: Raj Patel’s comprehensive investigation into the global food network is useful for students to reflect on patterns of poverty that persist today.Patel’s book sets out to account for “the rot at the core of the modern food system.” This is a curricular journey that our students should also be on — reflecting on patterns of poverty, power, and inequality that stretch from 19th century Ireland to 21st century Africa, India, Appalachia, and Oakland; that explore what happens when food and land are regarded purely as commodities in a global system of profit.